Although you can find accurate and useful information on the Internet (along with plenty of pointless but oddly alluring distractions), be careful. The web has become an advertising whirlpool. Sites that appear reputable and unbiased are often the fruits of large corporations or trade associations and have one underlying message: Buy a hearing aid! Get a reverse mortgage! You need more insurance! Some cater to advertisers, swaying information to please a drug company or retirement community, and others have “free advisers,” who get commissions for selling you something or signing your parent up for a housing facility, financial tool, or other product or service. AARP offers all sorts of information — referrals, resources and guidance on virtually every topic — for elderly people as well as their families. The Alzheimer’s Association is an oasis for anyone with, or caring for someone with, Alzheimer’s. The site provides an abundance of information on the disease, on coping and caregiving, and on local association chapters. Run by the National Council on Aging, this search tool shows you what federal, state and local benefits your parent is eligible for. Definitely worth a quick check as your parent might be eligible for a variety of discounts and help paying for medical care, utilities, food and other basic needs. Run by the National Hospice and Palliative Care Organization, this site helps families plan ahead, make medical decisions, and find a local hospice. You can also download state specific advance directives. Through their website, the VA offers information about benefits for veterans and their dependents. The Eldercare Locator, run by the Administration on Aging, will lead you to the “area agency on aging” where your parent lives, which should be your first stop as you research local services, benefits and options. For more detail about a wide range of medical issues another federal website, which will lead you to articles from a variety of respected institutes, universities, journals and agencies. For easy-to-read, basic health information aimed specifically at seniors, try this site of the National Institutes of Health. Based in California, this organization offers all sorts of support to caregivers. The Mayo Clinic offers solid, unbiased information about diseases and symptoms. The site also has a Symptom Checker. A government site aimed at educating consumers about Medicare health plans and policies, government publications and fraud. States have different rules concerning Medicaid, but you can get basic information and resources at this federal site. The coalition’s website has information on nursing home and other long-term care facilities, and can lead you to advocacy groups and ombudsmen in your area. The website has all sorts of information and resources for caregivers. SHIP will direct you to the State Health Insurance Assistance Program (yes, they excluded the “A” in the acronym), which provides one-on-one health insurance counseling and advice to people on Medicare. 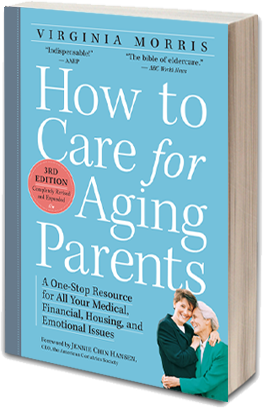 If your parent’s primary caregiver is your other parent, then be sure that he or she is getting the support to do that job. The Well Spouse Foundation offers emotional support, information and referrals to local chapters.